I think it’s too much of green overdose on my blog these days, just look at the last few posts it’s all green! If you have been following my blog for a while, you would know how much I love my greens. I am veggie-holic (is that a word? ), no seriously I am. I usually feel like eating a plate full of only veggies for lunch and dinner. Of course I don’t get to do that often because hubby wants his roti and rice but if left to me, I would happily eat only veggies for most of my meals. I am not partial to any vegetable, I like them all but spinach does hold a special place in my heart. Look at the all spinach recipes I have on my blog, this, this and this. Spinach is good on it’s own but it pairs beautifully with sweet corn. 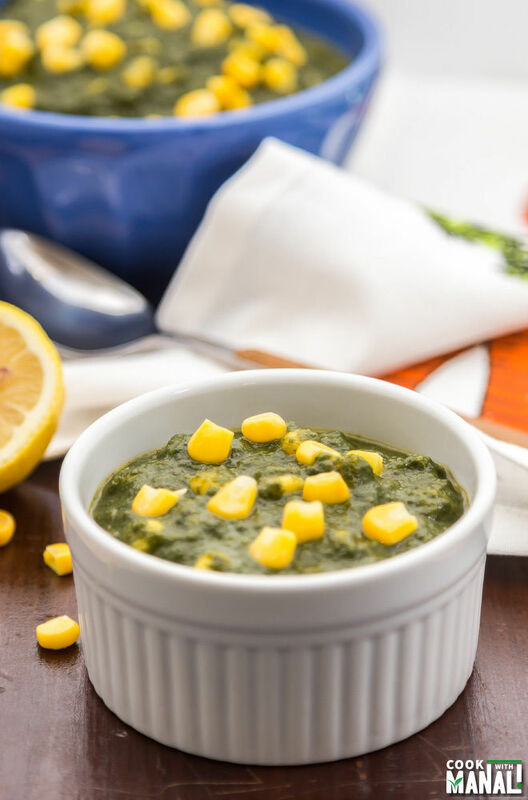 The sweetness of the corn balances out the little bland taste of spinach perfectly in this spinach corn curry. 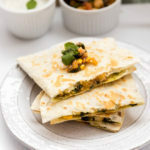 It is called Palak Makai or Saag Makai in India. Sometimes you are inspired by own recipes and this one is adapted from my spinach tofu curry. A lot of you have made and loved that recipe and so I thought of using the same ingredients to create another dish. 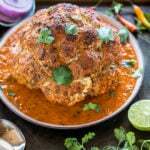 This recipe doesn’t require too many ingredients and is great with rice or any Indian flatbread like roti, naan or paratha. 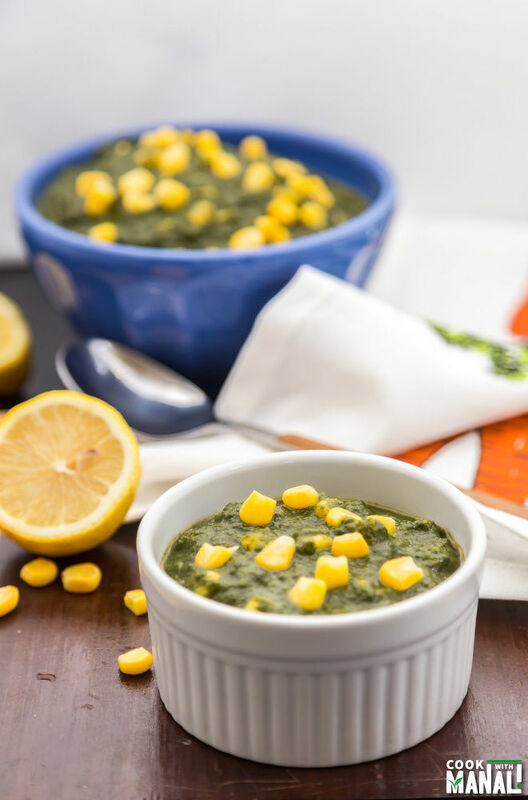 If you are looking for a healthy and delicious curry recipe, then look no further and give this spinach corn curry a try! In a pan, add washed baby spinach. Cook for 2 minutes or till spinach is wilted. In the same pan heat 2-3 teaspoons of oil. Once oil is hot, add roughly chopped ginger, garlic and green chili. Saute till raw smell goes away, around 1 minute. Add chopped onion and cook for 2-3 minutes. Add chopped tomatoes and mix. Cook the tomatoes for around 5 minutes or till tomatoes turn mushy. Add the wilted spinach and mix and cook for a minute. Next add in the dry spices – garam masala powder and coriander powder. Also add salt. Cook the spinach with the spices for 2 minutes. Transfer to a mixer, add 1/4 cup of milk (or coconut milk if vegan) and blend to a smooth paste. Set aside. In a pan, now heat 1 teaspoon ghee (or butter or oil if vegan). Add red chili powder and saute for few seconds. Then add the sweet corn and saute for 1-2 minutes. I used frozen corn and put them in warm water for 5 minutes before using in the recipe. Add the pureed spinach paste and mix. 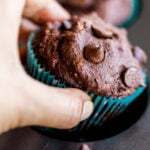 Cook for 2 minutes and then add sugar, 2 tablespoons milk and 1/2 cup water. Mix everything together and let it simmer for 5 minutes. Squeeze in some lemon juice (optional). Check seasoning and adjust to taste. 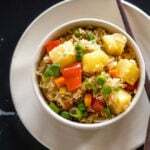 Serve the spinach corn curry hot with rice or any bread of your choice. * This recipe is not vegan. 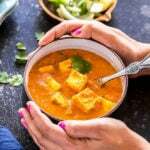 To make it vegan – use coconut milk in place of milk and oil in place of ghee. * Adjust the consistency of the curry according to taste and preference. Add less water and milk for a thicker curry. * You can add cream to the curry to make it richer and creamier! 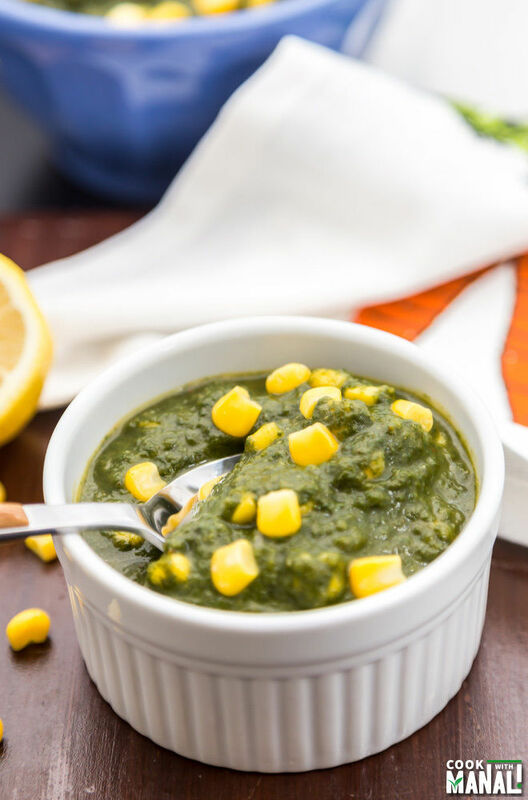 Healthy and easy Spinach Corn Curry. Serve it with rice or any bread of your choice. Cook for 2 minutes or till spinach is wilted. Drain and set aside. Next add in the dry spices - garam masala powder and coriander powder. Also add salt. I’ve never seen a curry like this, Manali! It looks fantastic! 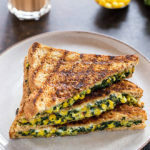 I love the combination of spinach and corn, sounds so flavorful! Thank you Gayle! It’s indeed very flavorful! Thanks Savita! you can have the entire bowl! Gimme this spinach corn curry and some rice and I would be a happy camper!!! delicious!!! Saag makai is my absolute fave! I love how creamy the spinach is here 🙂 Pinning! This curry looks wonderful! Love the addition of corn in this Manali! Yay for veggie-holics!! 😀 thanks Marcie! Anything curry-themed is totally up my alley! Especially if it’s green, so yep I am definitely craving this right now! 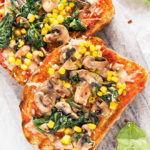 Love all the spinach and corn! I would love to taste your corn curry David!! 🙂 sounds yum! Its like you are on gogreen mission 🙂 Picture is sooo simple and yet so wow! 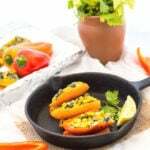 ’ve never tried spinach corn curry Manali!! But it looks fantastic, and I bet the corn give it a delicious sweet flavor. I love everything about this. 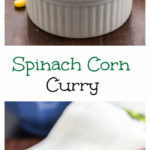 I’ve never had spinach curry but I can imagine it is so good and with the addition of the corn – so sweet! Love your creativity, Manali! This curry is so unique! I love how flavorful it sounds. I bet the corn goes great in here as well! I can never get enough of my greens! I totally agree with you on the veggies, I could happily just eat platefuls of them at the moment. I always find myself craving more fruits and vegetables when it’s warm outside! This curry looks so beautiful, I love all of the flavours in it, and spinach is always my favourite addition to curry! Love spinach! This curry looks wonderful! Love seeing lots of greens, especially if it’s spinach. This curry looks fantastic!